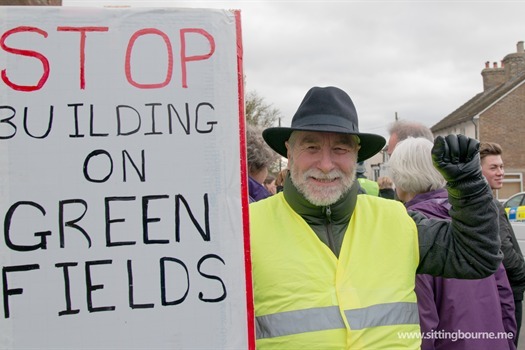 Momentum has been building since last May when Swale Borough Council announced which additional sites they had selected to add to the Local Plan to reach new targets set by Government Inspector Sue Turner a couple of months earlier. It’s fair to say that Sittingbourne is paying a heavy price in order to protect a large area of the borough around Faversham. One of those additional sites is a large area of land in the south of Sittingbourne between Borden Lane and the A249, known as the Wises Lane development. The development which consists of 675 new homes of which a maximum of 10% will be affordable, a new sports ground for the Sittingbourne Rugby Union Football Club, new primary school and promises of facilities such as a new GP Surgery has proven highly unpopular with the residents of Borden. 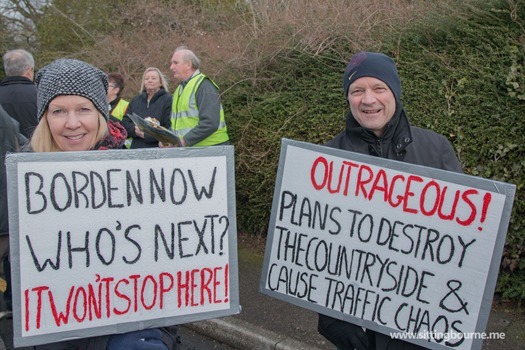 Today in a bid to speak out before the inquiry into the Local Plan reconvenes next week, members of Borden Residents Against Development (BRAD) organised a protest march from the Maypole Inn in Borden to the Swale House where they handed in a petition to council leader Andrew Bowles. Others were critical of the amount of affordable housing and ability of younger local residents to remain in the area due to high house prices. Cllr Mike Baldock who also opposes development in this location told us “Transport is a big issue , but there is also the importance of establishing a gap our villages and Sittingbourne." With cries of “hedgerows not houses “, “No more gridlock” and “Save our village” around 300 residents began to make their way along The Street and into Borden Lane on the long walk into Sittingbourne to be joined by even more protesters waiting outside Wilko before making the way along the High Street to Swale House. On the steps of Swale House, as BRAD member Gaynor Aspin confronted Council Leader, Andrew Bowles he said “At the end of the day we are not promoting the site” a point which I put the opposition party Councillors. On the subject of whether Swale is "promoting" this site, it says on the Council's website pages about the Local Plan "this site was allocated by the Council in the context of the Inspector's interim findings" Semantically allocating in response may not be the same as promoting but it is a bit much to try to dissociate Swale from the process. This site is allocated as the number 1 option from amongst the original omission sites. If you believe the developers that they will build a new sports field for the Rugby Club then you must be mad.......... Why waste month that's 10 more houses that they can sell and make even more money. It's laughable that people think that these new homes will help the homeless, if they could afford them they would not be homeless in the first place. "Affordable" is a term not based in reality and like with the schools commitment can be changed when the "viability" argument gets pulled by the developers. If this was for 30 houses I don't think it would cause much argument but such large developments are not sustainable. If all the brown feild sites were used and each village took 20-30 houses that would help as would proper town planning. Its not all about Houses!! To get a DR's appointment is a nightmare now, hospitals are at breaking point , traffic is a major problem! So when people comment , were there any homeless people on march , I don't know, but do you really believe building high end properties in Borden is going to help the homeless !!?? Seems like a case of I'm alright jack. I bet there weren't any homeless people on that demo. Move with the times, where would you suggest they build them, or don't you think they should be built at all.